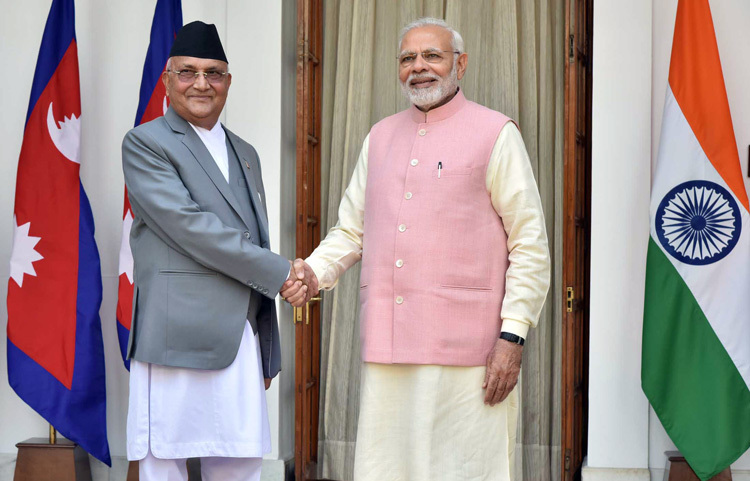 Prime Minister, Narendra Modi with the Prime Minister of Nepal, K.P. Sharma Oli, at Hyderabad House, in New Delhi on April 7, 2018. Nepal’s Prime Minister KP Sharama Oli’s three-day state visit to India from April 6 to 8 is being hailed as landmark albeit it was more about resetting relations after Nepal’s China drift, acrimony over the border blockade during the Madhesi agitation over amendment to the Nepalese Constitution, unsettled border issue, and even exchange of India demonetized currency that was legal tender in Nepal and such currency held by Nepalese nationals yet to be exchanged by India as promised(Nepal has over 300 million of such demionitised notes but unofficially there are over IRs.10 billion worth of such notes). Prime Minister Oli’s visit to India was his first foreign visit after taking charge albeit second as PM. During PM Oli’s visit, he and PM Narendra Modi jointly inaugurated the Integrated Check Post (ICP) at Birgunj, and the 69-km Amlekhganu-Motihari oil pipeline. The two countries also agreed to expedite the much-delayed Pancheshwar, Terai road and other infrastructure related projects. Both countries signed three agreements: partnership in agriculture; plans for connectivity through inland waterways, and; expanding linkages to connect Indian railway lines to Kathmandu. Significantly, India made it clear that it would not buy energy if China built dams in Nepal; contract for the 2.5 billion dollars Budhi Gandaki Hydroelectric project was initially awarded to China Gezhouba Group Corporation but former PM R Sher Bahadur Deuba had cancelled this contract for failure of the Chinese company to meet requirements. Prime Minister of Nepal, K.P. 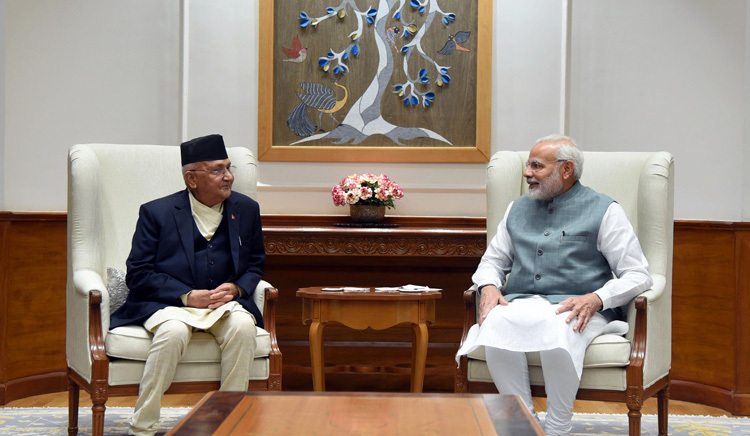 Sharma Oli calls on the Prime Minister, Narendra Modi, in New Delhi on April 6, 2018. However, immediately after Oli became PM, he gave a statement that he could renew the contract to the Chinese company that is expected to produce 1200 MW of power. Oli could have made agreement with India for the construction of Sapt Koshi High Dam, 900 MW Arun III project and the 600,000 MW Pancheshwar Project, considering Indian success story of the Friendship Dam built in Afghanistan. However, Oli will probably do so during his forthcoming visit to China that will include signing of agreements related to China’s Belt and Road Initiative. Chain can be expected to offer colossal soft loans and ‘debt trap’ Nepal in perpetuity on the lines of Pakistan, Sri Lanka and Maldives. There are views being expressed that a rail lines Kathmandu-Kolkata (extended to Dhaka in Bangladesh) and Beijing-Lhasa-Kathmandu together with shorter China-Kolkata sea link, would kill the viability of the CPEC but nothing could be more naïve. The strategic importance of CPEC, PLA bases at Gwadar and Jiwani (upcoming) taking control of Pakistan’s complete seacoast is a different ball game for China, which already plans to extend the CPEC to Afghanistan. India will do well to examine the threats via Nepal, which are far greater than open admission of “full support” to Naxals in India by Nepal’s Maoists. Mao Zhedong had said, “Tibet is the palm of China and Ladakh, Nepal, Sikkim, Bhutan and NEFA (Arunachal Pradesh) are its fingers”. China thinks 100 years ahead and so the Chinese Ministry of Foreign Liaison under Mao recruited and supported Maoist groups in Nepal, Burma, Philippines, Peru and Japanese Red Army, and Shining Path in Peru. Chinese intelligence infiltration operations into Nepal, that began decades ago, set off a self-perpetuating Maoist “People’s War” that has never really ended. It is in China’s interests to install a regime in Kathmandu that is not too friendly with the US or India”. 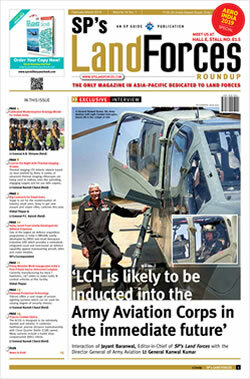 Much before Pushpa Kamal Dahal alias Prachanda became PM of Nepal, he told Nepalese media, “The ultimate war will be with the Indian Army”, which can hardly be construed a political statement, even as Nepal’s moves to stop Nepalese Gurkhas from joining Indian Army may be given benefit of doubt. But Maoists takeover of Nepal underscores the success of Communist China, which has consistently applied its hard and soft power in Nepal. India and Nepal have ancient and historical links. Indian and Nepalese armies enjoy excellent relations and Nepal should logically not like its territory to be used for anti-India activities. But China, together with its protégé Pakistan, is past master in playing the sub-conventional card. Take the case of Myanmar where China has created proxies in the 10,000-strong United Wa State Army (USWA) armed with missile-fitted Chinese helicopters, and the United Liberation Front of West, South East Asia (ULFWSEA) as means to pressure both India and Myanmar. Indian Army has been conducting bilateral joint exercises with Nepal, Myanmar and China, but that does not deter Beijing pursuing its nefarious agenda. Remember few years back media reported four Chinese nationals caught with fake Indian documents en-route to meet Naga rebels; which perhaps led to NSCN (K) abrogating its 14-year old ceasefire with the Indian Government. Chinese are past masters in pushing their anti-India agenda via Nepal in a manner that Oli can do little about it - just like Myanmar. Integrated border check-posts (still long-way off) can only help if movement other than these posts is met with force, which is unlikely with occasional patrolling. Nepal deploying drones along the border,, which will obviously be Chinese, can also be used for assisting infiltration of terrorists, arms, narcotics and drugs - in line with China’s concept of ‘Unrestricted Warfare’. It will be foolish to believe that China will forsake her illegal territorial claims because of connectivity and economics; her recent protests against purported Indian ‘transgressions’ in Asaphila should make this clear. China’s occupation of North Doklam, constructing road and posts in Shaksgam Valley must be viewed in concert with the threat to Siliguri Corridor. Pakistani PM SK Abbasi’s visit to Nepal in early March too must be seen in context of not only a well-oiled network in Nepal giving protection to ISI-backed terrorists, but becoming a “Control Centre” as per the IB, which the China-Pakistan anti-India nexus is liable to exploit supported by Nepalese Maoists. Earlier ISI-backed terrorists transited Nepal to sabotage our trains and railway network, but now it may be for much more. Eminent scholar and China-watcher Claude Arpi wrote in 2014 of PLA soldiers in uniform deployed in Northern Nepal in 2014. Nepal’s agreement permitting China oil drilling in Terai region will bring the PLA to Terai which is already infested with ISI-backed radicals. Ironically, such acts will likely be supported by Naxals and Indian Communist political leaders frequenting visiting Beijing. India must also watch out for Bhupalese refugees in Nepal headed by a former officer of the Royal Bhutan Army, which China may exploit to pressure Bhutan and India - Oli being a pawn or complicit. These are clear and present dangers, which India can ignore only at its peril.